Improved survival outcomes with chemoimmunotherapy in patients with chronic lymphocytic leukemia (CLL) are associated with minimal residual disease negativity (MRD–; <1 CLL cell in 10,000 leukocytes [<10 -4]), but the importance of MRD with targeted agents and in the relapsed/refractory (R/R) setting remains unclear, mostly due to low MRD– rates with these agents. In the Phase 3 MURANO study, venetoclax + rituximab (VenR) showed superior PFS (hazard ratio 0.17) and higher peripheral blood (PB) and bone marrow (BM) MRD– vs bendamustine + R (BR) in R/R CLL patients. To report MRD kinetics (percent of patients achieving MRD <10-4, 10-4 to <10-2, and ≥10-2, at various timepoints), and MRD response in CLL cytogenetic and molecular risk groups in patients from MURANO. Patients were randomized to VenR for 6 months followed by single-agent Ven ≤1.5 years, or to BR for 6 months. PB samples were serially collected whereas BM samples were collected at the end of combination treatment assessment (EOCT; Month 9) or at best response; MRD was analyzed centrally by ASO-PCR and/or flow cytometry. High concordance was observed between PB and BM MRD status (84%) in patients with paired samples. Higher agreement in MRD– between BM and PB was seen with VenR (45/50 [90%] PB MRD– were also BM MRD–) compared with BR (3/10 [30%]). Given this concordance and availability of serial PB sampling, we focus on PB MRD and outcome. Best MRD– (at any time on study) rates were higher with VenR (84% vs 23% in BR), and were independent of high-risk cytogenetic and molecular factors only for VenR: del(17p) present vs absent: 83% vs 87%; TP53 mutated vs unmutated: 73% vs 88%; IGVH unmutated vs mutated: 82% vs 89%. 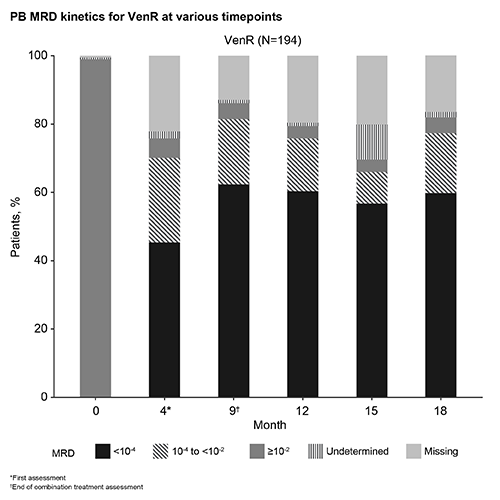 PB MRD kinetics for VenR are shown in the Figure. Among 121/194 (62%) patients who were MRD– at EOCT with VenR: 100 (83%) maintained MRD– and were PFS free at a median follow-up of 13.8 (5.6–23.0) months; 2 patients developed progressive disease (PD); 2 died (unrelated); and 2 patients developed Richter’s syndrome (with one MRD+ directly before). The remaining 15/121 (12%) patients converted to confirmed MRD+ (2 serial assay-positive assessments) at a median MRD+ follow-up of 5.6 (0.03–11.2) months; 1 patient had MRD ≥10-2 with PD, 14 patients had MRD 10-4 to <10-2, 2 of which had PD, 1 patient died, and 11 patients remained PFS free. MRD kinetics by patient including treatment status will be presented.